Mike has already started demoing the bathroom. No rest for the wicked. Before I get into the plans I need to share how the space started. Early this week I showed you the layout and the removal of the chimney. As you walk downstairs and turn left you look straight into the bath with the nook on the right and a closet that goes the whole length under the stairs on the left. The bathroom is not a large space, but it's definitely not the smallest space either. 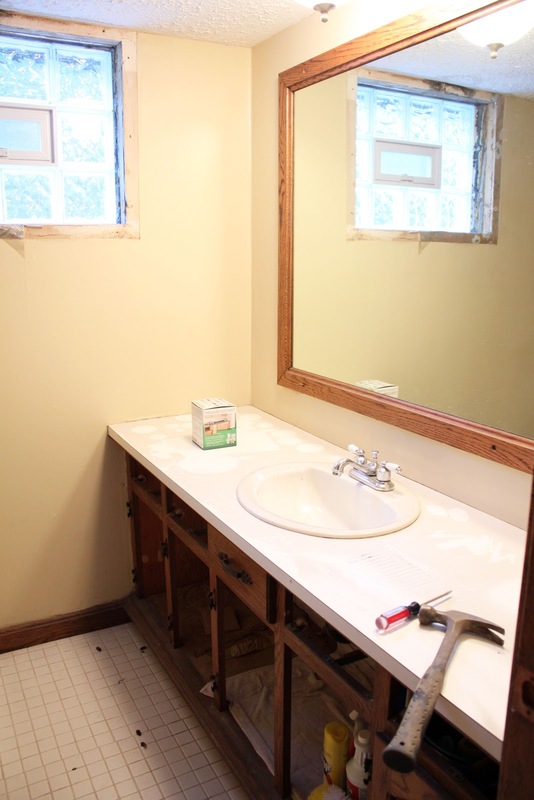 The vanity with a sink in on the right, and the shower, (first), and toilet, (behind the half wall), is on the left. Note: please excuse the dirtiness, the chimney removal made everything filthy. Now the water damage on the ceiling and mold around the window - that's all left by the lovely former owner. 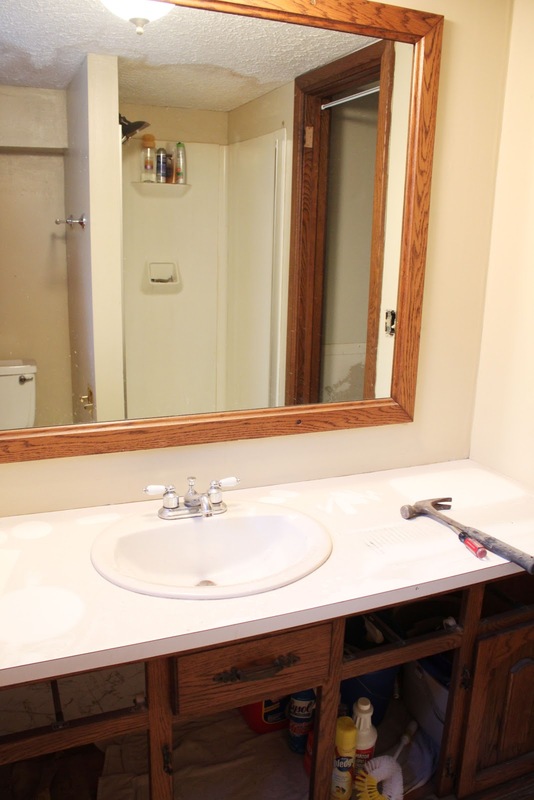 The vanity is huge for a basement bathroom. The mirror does help to make the room feel bigger, but it's not really necessary. Neither is all the counter space or storage. We don't need to store any products or anything, just enough to function as a bathroom, (extra toilet paper, soap, etc.). We've actually been storing our left over paint cans in the cabinet. And since the walkable part of the room is pretty narrow, it was easier to get the other side through the mirror. The shower is just an insert and is extremely small, (about 36" x 32"), the toilet is separated by a half wall from the shower. 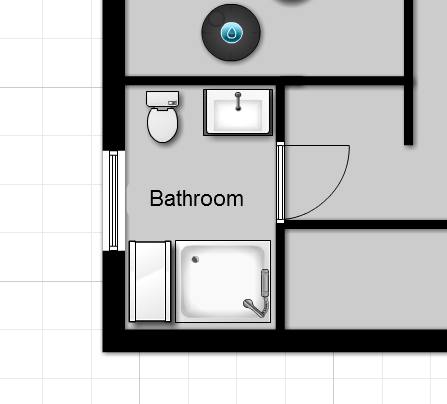 The layout isn't horrible, but like I said we don't need that much counter space or cabinet storage, so I suggested using a smaller vanity, then moving the toilet to the other side of the room next to the sink. 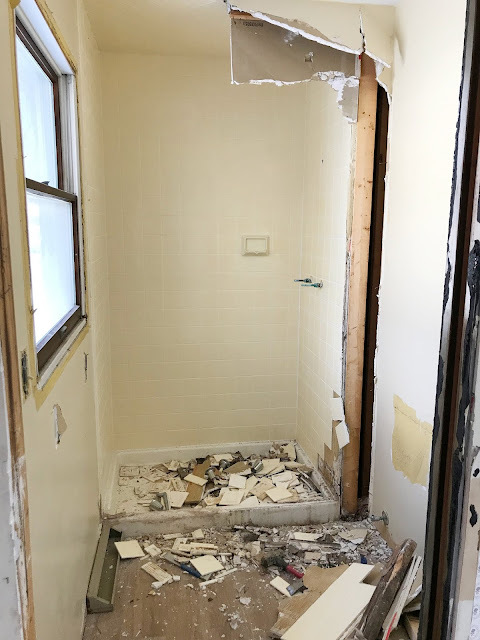 This allows us to get a larger shower insert, (we're keeping our costs down, so we're not messing with tile, or anything crazy), and add some storage where the toilet is now. 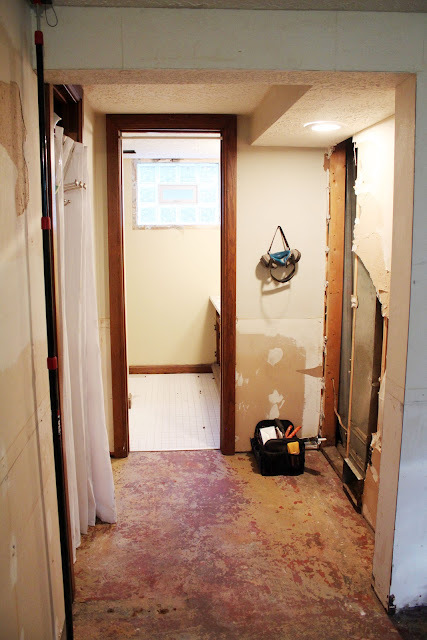 Mike's not very excited about moving the toilet since it requires jack-hammering the floor to move the piping, but he wanted to replace all the piping anyways, and plans to dig up the future family room floor to replace everything out to the main line anyways. So what's a little more concrete demo, right? To show you the plan in picture form, here's the existing layout. And the new layout we have planned. 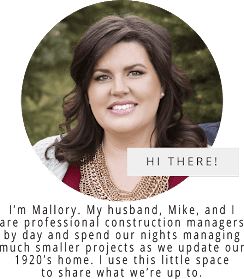 Now that you know where we're starting, and since demoing leads to rough-in's, I needed to get my act together to start making decisions about what I want. 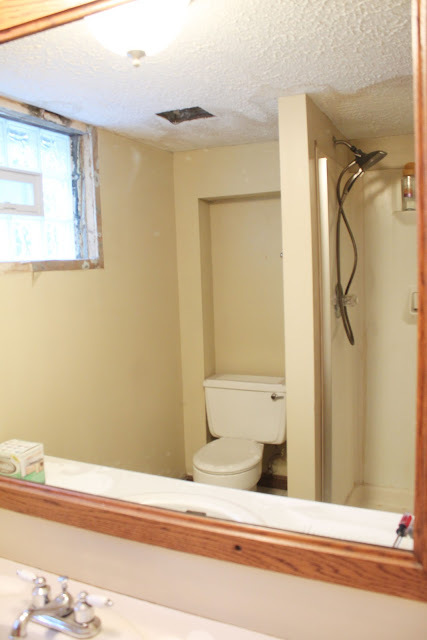 Since we're in the middle of planning a wedding, just got off the heals of our main bathroom renovation, not to mention we have the main basement room to convert to a family room, we want to keep this room pretty simple and inexpensive. I also thought about how we're going to use this room. Obviously, it's a bathroom so we all know what it's used for, but more specifically how. It is a basement shower which will only be used by Mike to clean up after getting really dirty, (like the times where his clothes go straight into the washer and he runs into the shower - which is quite often actually). So, the room has to be a little utilitarian, but it's also attached to our future family room, so it has to be comfortable enough to use when we're watching movies or guests are all gathered on the couch. We want to keep the same features of the house like the large baseboards and the more traditional feel, but I thought it would also be fun to throw in some industrial features to make it more masculine, since it is a basement and will be used by mostly Mike. It's also the direction I'm heading in my plans for the family room, (more on that when I can get some ideas put on paper). So, I put together a little mood board to get some ideas together, (and most importantly to show Mike). 1. A very popular way to add industrial features to a room is by using outdoor lighting. It's also a lot cheaper! I like this galvanized wall sconce to use over the vanity. We'll also be installing a new fan/overhead light combo and will probably use the same one used in the upstairs bathroom since it will add light and not compete with this fixture. 2. I usually like rectangle mirrors, but I want to move out of my comfort level and I think this one from Ikea is simple and the metal frame has a slight industrial feel. And, for under $40, you can't really beat it! 3. This is a more traditional vanity, but with simple lines, so if we want to change the room, we won't have to change any of the major items. I also looked at a lot of vanities with tops included from the big box stores like Home Depot and Lowes, (since the closet Ikea is almost 2 hours away), but they all had three holes already drilled for the centerset faucets. Like I mentioned back before we demo'd the upstairs bathroom, I hate cleaning those faucets with the two handles on each side. I love the simplicity of our new faucets, and this vanity has a center hole that we can add the faucet we like. 4. This shelving is something I'm really excited about. 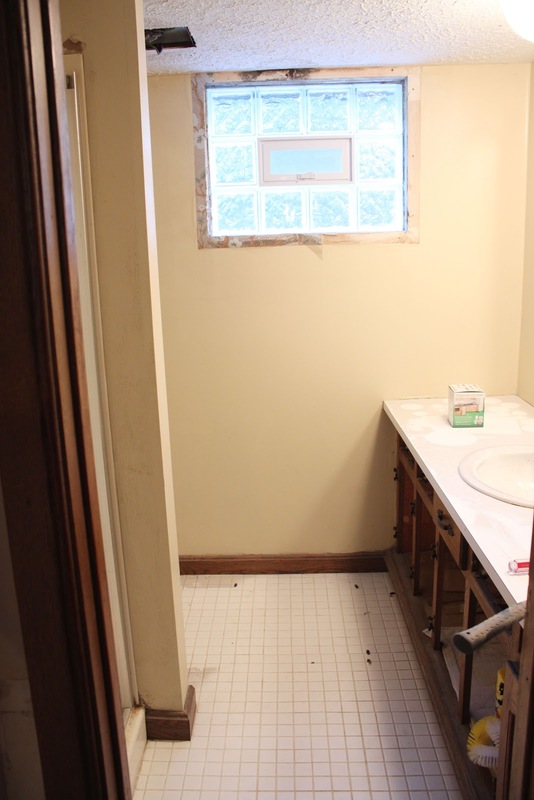 Although, it might not make it into the alcove behind the shower, (after talking with Mike, we're thinking we may want more closed storage to store things like the cat's litter, and other things that have never really had a home), we may modify it to use above the toilet. It's been floating around the blogs for years. It's very industrial, but adds some warm wood tones to an otherwise sterile room. Unlike the original photo found here, we would only use two pipes since we're only filling a space a couple feet wide. The best part is it's totally a DIY project that will be a cinch for Mike and I! 5. I'm hesitant to put a paint color here, (I try to forget that I painted the upstairs 3 times before finding the right color), but this is just for inspiration. 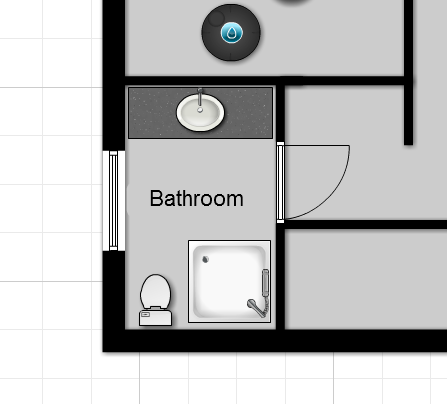 I want to keep the walls really light, which is definitely out of my comfort zone, but the bathroom is in the basement, and on the smaller side, so I want to keep it light and airy. I also don't want a color dominating the room, but rather have all the pieces showcased while the walls fade away. I think this color, Sea Salt, by Benjamin Moore is a nice gray, with subtle blue undertones that will look nice against the metal, wood, and white in the room. 6. I like adding a little greenery to a bathroom to make it feel a little warmer. Since it's a basement, and I have a black thumb, these fake plants from Ikea are perfect. 7. Since I said this will be used mostly as Mike's bathroom when he's working and getting dirty, (or not working and getting dirty, it must be a boy thing), I can't have fluffy white towels down there and expect them to stay nice. I think a couple of dish towels, like this one, or this one, will work as hand towels for rough and tough hands like Mike's. The red and blue accents also add some needed color in masculine tones. 8. Finally, the open shelving will look great with some wire baskets and even some wicker baskets. I'm sure we'll add more and more stuff down there as we start using it, so it'll be nice to have some storage options to hid everything in. So, that's the plan. I'm really excited to do something out of my comfort zone, and a lot more masculine than I've done before. I also think it'll be nice tie-in to the plans I have for the future family room. Check back to see those plans soon! What an exciting project! 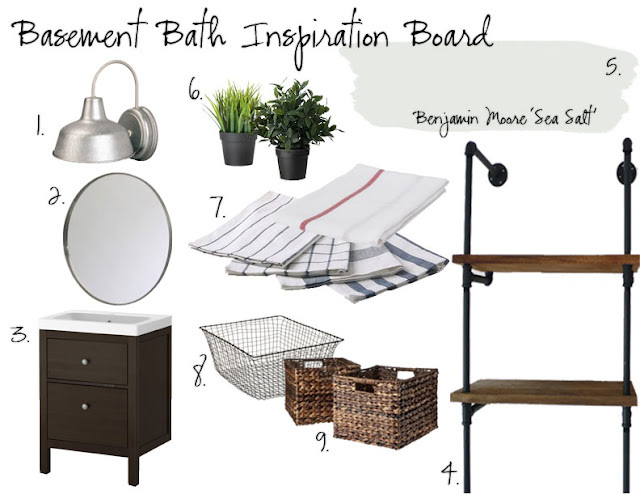 Love everything you've selected for your bathroom makeover. Can't wait to see what it looks.